There are many diffrent ways to make and design sawhorses. Described below is how you can make a set of sawhorses using 2x4's. Another way to build sawhorses is to buy a set of sawhorse brackets . Sawhorse brackets are recommended for general use cause they are easy to store and disassemble. Before building your sawhorses there are a couple things to consider. How tall you are and how high you want the sawhorses to be, and how wide you want to make them. For general use using 2x4's to make your sawhorses will serve there purpose but lacks the ability to be easily disassembled or stored. You will need enough 2x4's to cut eight legs and four main body pieces, and an additional 6' of 2x4's to make braces for the legs. After determining your desired height and width, cut eight legs and four main body pieces to these measurements. Assemble the main body pieces, take two of your pre-cut pieces and stand one up on its side vertically and lay the other on top making a "T" shape. Make sure the ends of the boards are even and nail them together using 16d spikes. Nail the legs onto the main body using a total of four nails,nailing two nails in both of the main body boards. Nail the legs onto the main body one side at a time. 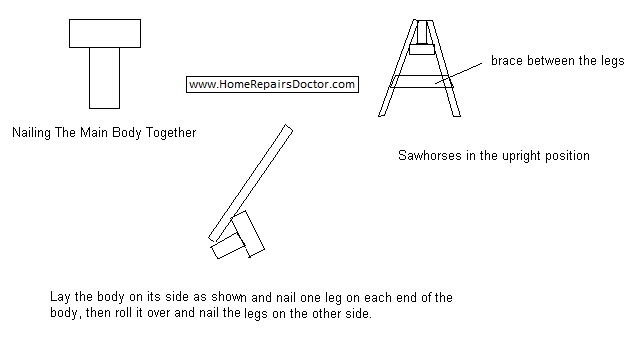 Refer to the diagrams below for assembling the sawhorses.